Betty Jean Miller was born December 2, 1945, in Willmar, Minnesota the daughter of Jimmie and Florence (Lee) Mead. She grew up in New London where she received her education. On June 29, 1963, Betty was united in marriage to Marvin Miller in New London. This union was blessed with two daughters. The family made their home in New London until 1987 when they moved to their current home near Spicer. Betty worked for Jenni-O for a short time before beginning her career at the Willmar State Hospital. She worked there for 23 years before her retirement in 1998. Betty was a hard-working family orientated wife, mother, grandmother, and great-grandmother. She enjoyed camping, fishing, snowmobiling, completing puzzles, and feeding birds. She and Marvin enjoyed traveling and wintering in Texas. Above all else, Betty loved spending time with her family especially her grandchildren and great-grandchildren. 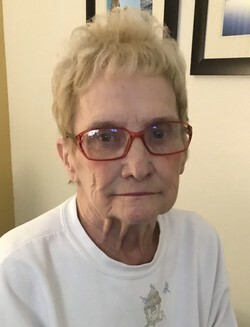 Betty J. Miller died Wednesday, January 30, 2019, at the age of 73. She is survived by her husband of 55 years, Marvin; daughters, Sandy (Chad) Gerdes of Villard, and Rhonda Miller of New London; grandchildren: Shawna (Anthony) Allegrezza, Meghan (Aaron) Williams, Brady Gerdes, (fiancée, Peyton Horn), McKenzie Gerdes (special friend, Ryan Mikkelson), Nathan (Samantha) Carlson, Nicholas Carlson, and MaKayla Lee; great-grandchildren: Ashton and Kylie Williams, Hudson Allegrezza, Cooper and Callie Carlson, and Jessian and Danica Carlson. Betty is also survived by her siblings: Elmer (Shirley) Mead of Spicer, Mary Nordin, of Alberta, Martha (John) Masters of Iron, Harvey (Julie) Mead of Hinton, OK, Essie (Jon) Erickson of Foley, Carol (Danny) Hustoft of Albert Lea, David (Bonnie) Mead of Waukesha, WI, Chuck (Lynn) Mead of Duluth, Laurie (Steve) Gehrke of Spicer, and Joe (Lisa) Mead of Paynesville; and many nieces, nephews, and cousins. Betty was preceded in death by her parents and her brother, Roy.